JA Telines have been our most of the popular news series templates and all have been heavily deployed. 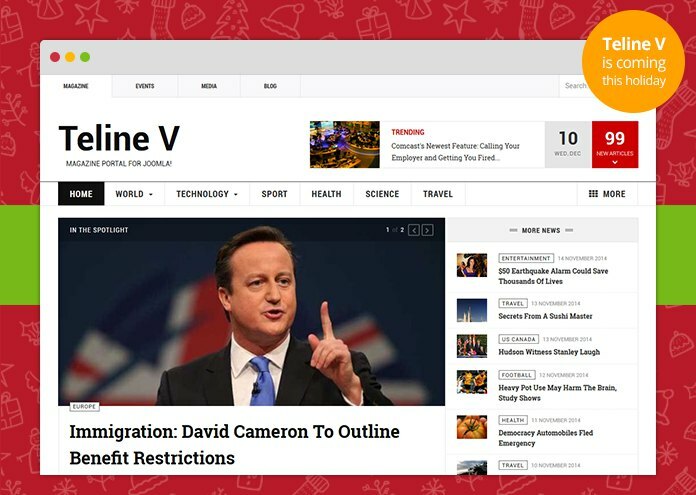 This December, JoomlArt kicks off the JA Teline V project to continue the journey in developing the best Joomla news template series. With motto "Content is king", JA Teline V’s ultimate goal is to find the balance between design and functionality. For today, we only have landing page to preview and remember it's just 30% done. Let us know what you think. Next week we will come up with more previews as the sections take shape. The release is scheduled before Christmas. While the development is on the fly, we are open to all your suggestions, wishlists you wish to see in JA Teline V. We will find the best solutions where possible. Love to hear your thoughts in the comment section! Leaner LESS and PHP codes. Please check out the latest demo of Teline V and tell us your thoughts! See JA Teline V Live Demo!